I want to apologize first for running behind. I knew from the very beginning just which of my hoarded beads I wanted to use as my focal but between procrastination, migraines and veritago I finished up this necklace at the last minute. Actually beyond the last minute since I finished it up a couple hours past the time I should have posted. So much for my grand plans of making up a few designs from my hoarded beads. I really felt that it was appropriate that I use this focal since it was the start of my 'hoard' of art beads. Back when I first started blogging, I won this bead from one of those huge blog hops that featured all kinds of handmade art. I don't even recall who made this beauty so if you recognize this style or if you were the artist who made it, please let me know. I would love to give credit for this baby. For some reason, the golden squiggles on this focal has always reminded me of the various religious symbols that can be found world wide. 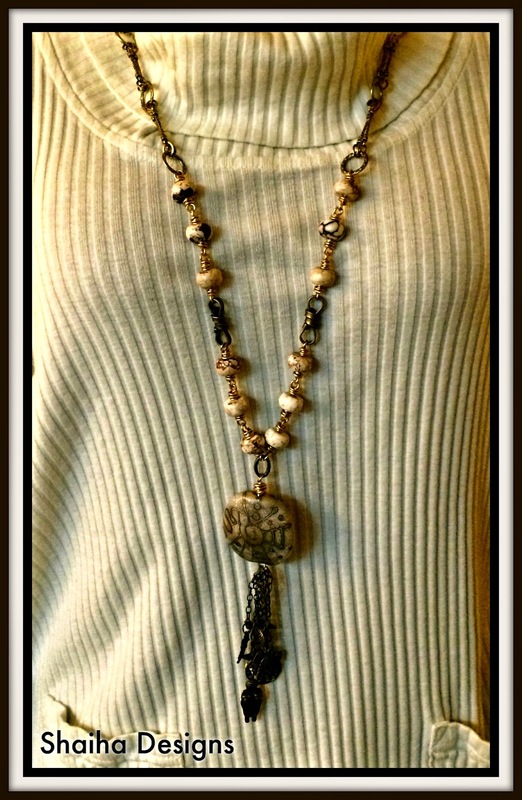 I wanted to play this feature up by adding my own symbols hanging from the end of the chain tassel. This necklace is for me so I wanted it to be longer since I like to play with my jewelry. 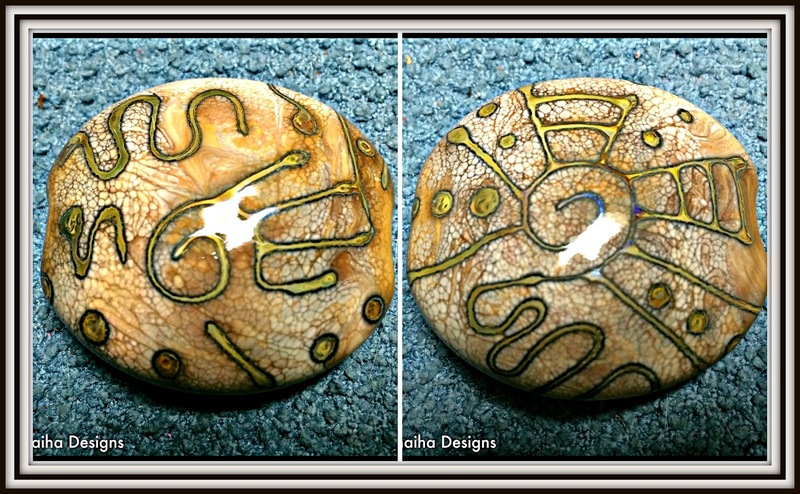 I also wanted to use a stone with vibrations that I could attune. I ended up deciding on Magnesite because this is a calming stone that also aids the wearer in aligning their desires with their heart's needs. What could be better? I also used some brass chain and some brass wire. Now this is a hop and there are a lot of us that like to hoard beads so be sure you grab a cup of tea (or coffee) and check out what everyone else has made. Just click here to go to the participant list. This is awesome. And I LOVE finding other beaders who appreciate the semi precious stones for their energies and not just their colors. Magnesite is indeed perfect for this piece. Simply stunning. What a magnificent focal. 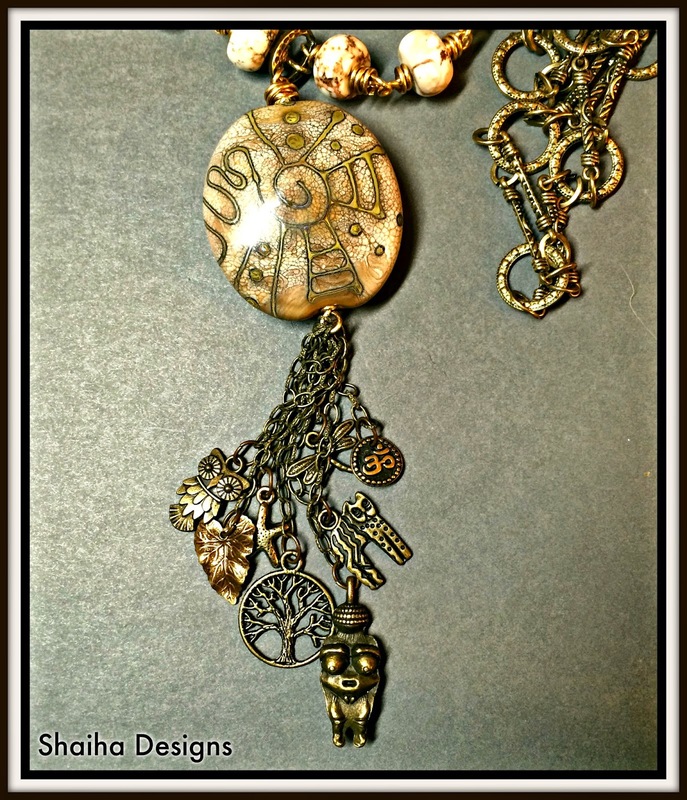 I adore the beads you have paired it with and the brass wire is a wonderful compliment to the other contents. I am sure you will enjoy your new piece of jewelry. gorgeous gorgeous gorgeous! I love the concept and the finished design. nicely done. what a beautiful bead... very well done... Love all the other elements that you have addes. Your necklace turned out great. I like the idea of dangling symbols from the pendant. Well done! Beautiful and brilliant design! Love the neutral color palate too. That is a spectacular necklace. Wowzers! I did not know that about magnesite. I use it in a lot of designs because I'm drawn to it. Maybe it's been trying to tell me something. Beautiful necklace ! Absolutely love this piece! That is beautiful! I love all the charms at the end. 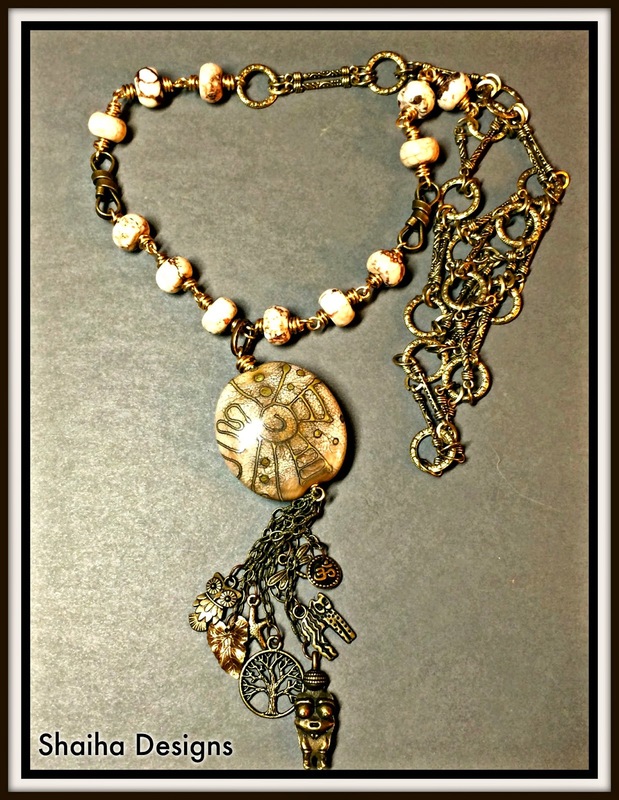 Love that focal bead and your necklace came out perfect. Awesomeness, the pendant is stunning and I love the length! Hi Shai, It is interesting to me to see where others got their start. Using your first hoarded bead was very appropriate for this hop. I did that last time. Your design is wonderful. This piece looks like it could be worn with any color. Beautiful! 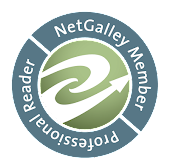 Thank you for sharing your work with us. I love that focal bead. Not to worry about getting started late. I'm only hopping just now. Your necklace is gorgeous. I love that focal and I especially love the charm filled tassel. Love that you used the art bead that started it all! Beautiful. I love all the symbolism of the pendant and of the charms too! I didn't know the properties of Magnesite, I am drawn to it but had no idea why, now I do! I'm sure it will become a favorite of yours to wear! Gorgeous :) I think it was totally worth the wait- both for the bloghop, as well as for finding the right design for that beautiful bead! What a stunning pendant and I love what you did with it. It looks great combined with the antique brass metal.That was an inspired idea to hang the charm tassel from the pendant! That bead is stunning. In fact, it looks quite a lot like a bead I got a few years ago from Bronwein Heinlein and now I'm even more inspired to work with it. You know I ADORE tassels, especially ones with lots of neat things attached to the ends. This is really a very cool work of art (and heart!) and I hope you enjoy wearing it often! 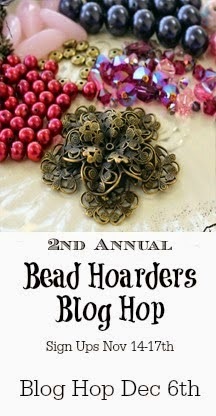 Thank you so much for participating, and don't forget to post your pieces in the special Pinterest board, http://www.pinterest.com/limamike/bead-hoarders-blog-hop/, and join the Facebook group (also welcome to your friends) www.BeadSoupCafe.com -- hope to see you at other hops! I love that focal, and the necklace is just stunning. Beautiful and I love the tassel. What a fabulous piece! Love the fun tassel! Great job! Love that focal Shaiha its has such an organic feel, its so nice when we can make something for ourselves the little charms just add that special touch! I would sooooo wear that!!! It is earthy, has great texture and wonderful movement!!! Wonderful! Have a Blessed Day!!! What a cool focal - the squiggles reminds me of ancient cave paintings! Isn't it funny how art is interpreted differently! Love how added the tassel - it's a great way to bring focus to the large focal! So pretty!